In this particular case, I’m referring the person this pattern is named after, a brilliant and beautiful Australian friend of mine. Because she lives “down under”, I had to knit this during the summer. I tried several other things, ripping back several times, until I let the design simplify and knit itself, based solely on a stitch pattern from an old Tricot stitch pattern book. 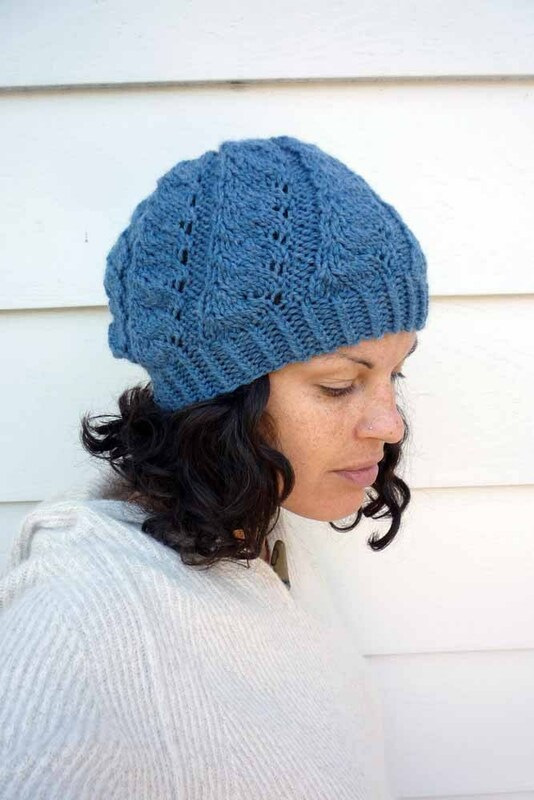 Like Arrow, this one features a twisted rib brim and a simple stitch pattern (in this case, Spiral Stitch) that looks fancy, but it’s easy enough for a beginner who’s comfortable working in the round. The Ravelry pattern page is here. There’s also a handy-dandy little “print-friendly” button at the end of this post so you can print or PDF this pattern easily. This is not a “professional pattern” and is being offered up for free (and as such, nope, I didn’t gauge, because I hardly ever do when I whip up a hat since I use the same needle size almost every time and I know myself). Many people have knit it in the past 9+ years with beautiful results, and any errors that may have been encountered in the original pattern were worked out long ago by enthusiastic and courageous knitters like you. *k1, kfb; repeat from * to eor. 108 stitches. Begin stitch pattern. Round 1: *p3, yo, k4, k2tog, k3; repeat from * to eor. Round 2: *p3, k1, yo, k4, k2tog, k2; repeat from * to eor. Round 3: * p3, k2, yo, k4, k2tog, k1; repeat from * to eor. Round 4: *p3, k3, yo, k4, k2tog; repeat from * to eor. For a more fitted hat (as shown), repeat the above four rows 9 times for a total of 36 rows (not including brim). For a slouchier hat, add additional repeats (per personal preference) of these above four rows. Round 37: *p2tog, p1, yo, k2tog 4x, k1; repeat from * to eor. 72 sts. Round 38: *p2tog, k2tog, yo, k2tog 2x; repeat from * to eor. 45 sts. Round 39: *p1, k2, yo, k2tog; repeat from * to eor. 45 sts. Round 40: *p1, k2tog 2x; repeat from * to eor. 27 sts. Round 41: *p1, k2tog, k1, k2tog; repeat from * to last 3 sts, p1, k2tog. 18 sts. Round 42: *p1, k2tog; repeat from * to eor. 12 sts. Round 43: *p1, k1, k2tog; repeat from * to eor. 9 sts. Round 44: *k2tog, k1; repeat from * to eor. 6 sts. Cut yarn and with tapestry needle, thread through remaining stitches on the needle. Weave in ends. Block if preferred.